This was a bit of a mad dash, but worth it to pick up one of the five grounds I have left do to in this division. It was a five o’clock start, straight from work, with a pit stop at Trinny Woodall services on the M1 for a quick change in the car into ‘me civvies’ and a take-out coffee. Travelling North-East from Stoke always give you the dilemma of whether to wend a more direct but tortuous route through the pennines, or whether to circuit them on motorways, adding on dozens of extra miles but with the possible outcome of a quicker journey. I opted for the latter tonight as my work is right on the A50, so I could bomb down there to the M1 and thence upwards. I say bomb, but in my ageing and pockmarked punto, it was more of a damp fizzle (and at speeds of above 65 an agonising scream). As it turns out I arrived in plenty of time, which I was glad about as I had come to expect pointless queueing and inane bureaucracy at new grounds. The fixture was a promising one as Donnie were in 6th, the Albion in 7th; they had gone eight league games unbeaten, we had gone six. It was a clash of the in-form teams. This, in a brand new stadium, was in complete contrast to the exact fixture almost exactly 10 years to the day, when it was 92nd vs 91st; Donnie heading out of the league to three figure crowds, and us being made homeless. Both clubs have come a long way. I think Brighton’s new manager Dean Wilkins has done a fantastic job so far. Ray’s brother, and former Albion favourite, Dean, has pulled together a great team with no money; with five or six of the old youth team now first teamers. Players such as Dean Cox and Jake Robinson are a credit to the division. Doncaster’s website and link to the Keepmoat website were very useful and informative, and gave clear parking advice, ticket information and maps to download. The official car parks were £5 each, but you can park for free at the old Belle Vue and walk down, which apparently takes about ten minutes. There are also park and rides. I would recommend parking in one of the pubs or restaurants of the big retail and leisure park that surrounds the stadium. It is a bit like Sixfields in that respect. I parked in MacDonalds (let’s face it, none of the staff are going to check who’s parked where and for how long). From Macdonalds it’s a 3 minute walk. 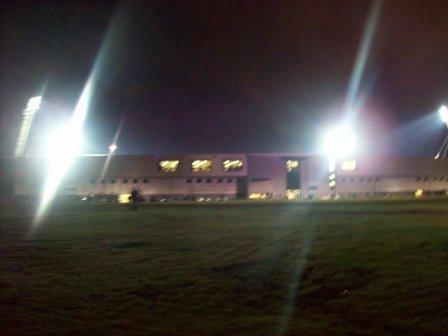 The stadium looks impressive from a distance and you can see it shining from a long way off on the route in to Doncaster. It is marked distinctively by its inward pointing floodlight pylons, which I think are a nice touch. In these days of utilitarian stadia design any architectural gimmick or flourish is a good thing. 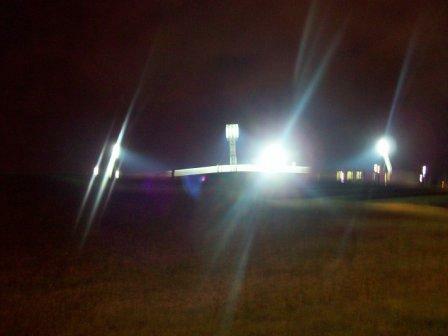 I think the floodlights work and give the impression of them bending in to get a better view of the action. The outside of the ground is very pleasing too, with smooth curves and lots of glass. All the roof supports are hidden beneath the roof on the inside and look like giant Meccano pieces. It looks so much better when the roof struts are inconspicuous like this, rather than the very ungainly looking struts on the outside like at Derby, Stoke, Man Utd and a number of other grounds. I wonder if it is dependent on how big the ground is? I’d be interested to know if there’s any Stadia design gurus reading this. Due to photographic limitations I am unable to give you a good view of the outside, so you’ll have to take my word for it. It is certainly an inviting prospect as you walk the paths towards the ground in the dark. As I said, I was gearing myself up to get wound up about queueing for a ticket for a fairly low attendance, but I was pleasantly surprised. Away fans did indeed need to purchase a ticket at the ‘Community Changing Rooms’ at the north side of the ground; but far from being a chore, I was welcomed into this plush glass-fronted carpeted room, which was more like a hotel reception, where sat three ladies, one of which teared off a ticket for me. It was a thirty second job. 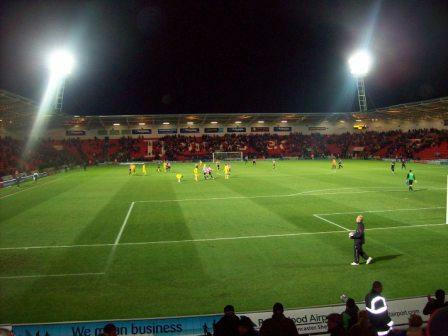 The Keepmoat had the traditional football catering of murderously hot coffee and awful food. 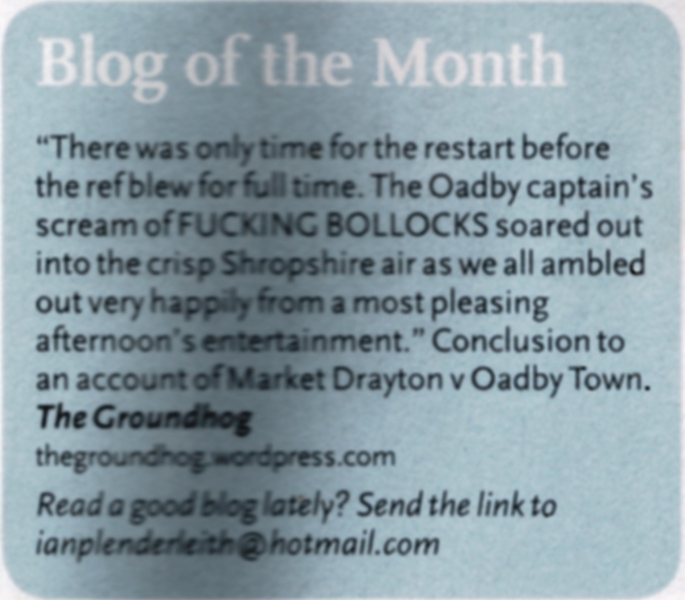 This isn’t a dig at Doncaster – I hate all football ground food almost without exception. I don’t think I’ve eaten at a football ground since Underhill in 1994; but as I had had no tea, I was under strict instructions from the missus to eat something to have some energy for the drive back. I plumped for a burger which came in a bag, like a body bag come to think of it. It was disgusting, with a toast-like bottom bun and soggy cold top one with something made out of rubber in the middle. The coffee was ok! 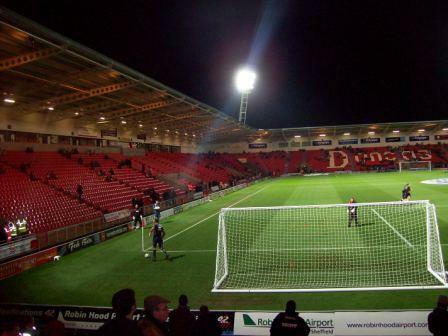 The Keepmoat is an entirely enclosed stadium with a capacity of 15,231. It ascends about 18-20 rows up all round with executive boxes one side and a TV/Press area the other side. One thing that disappointed a bit was the distance between the touchline and the stands. At the away end it was a good 10 metres at least – a large swathe of grass followed by sections of tarmac and concrete. I don’t see why it had to be quite that big. Also I think the capacity is a bit ambitious, with the stadium feeling very empty and the home fans singing barely at all, all match. Despite these criticisms it is a nice stadium, and to be fair, there wasn’t much to sing about all night. It was a bit of a disappointment considering its billing as a six pointer between two in-form clubs. I thought we were the better team in the second half and really did suffer from a weak referee, who let Bas Savage get fouled all over the place without batting an eyelid. In injury time Bas was in the area about to header the ball when a Donnie defender climbed up his back, getting purchase off his forehead and nose while kicking him in the arse…but again nothing. We were also subject to one of those old-fashioned linesman who think the offside rule applies when the ball lands rather than when it’s played. This cost us several times; once when Robinson had been in his own half and the ball had been hoofed into the air, and stayed there for about five seconds, before landing at Robinson’s feet. The linesman flagged when it hit Robinson, about seven seconds after the initial kick. He really should be struck off. But it’s still less than 24 hours later and I’m still in the bitter, maybe slightly irrational, away fan mind-set! 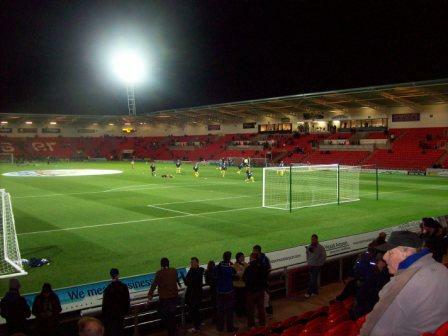 The Keepmoat is a smart and modern new ground – really impressed by the architecture and the general feel. It definitely has something about it that sets it apart from other new builds. It’s a good away point for Brighton on paper I suppose, and that makes six away league games unbeaten, eight including cup. This entry was posted in Groundhopping, Travelog and tagged 100 football grounds, doncaster, donny, keepmoat, new stadia, Non-League. Bookmark the permalink.